Please lend your support to May 12th – International ME/CFS & FM Awareness Day through Facebook or support your local or national ME/CFS or FM organisation in their work. The last active Blogging for ME/CFS was in 2010. It’s great work you’re doing. I’ve just recently started my own blog, trying to promote awareness of ME/CFS. I have put the badge on my blog page. Thanks very much and thanks for the badge/link to the site. Hope you’re able to do something on your blog for ME/CFS Awareness in May. I’ve added your blog to out list. This is a great idea! I always try to post some awareness stuff in May to commemorate Awareness Day on my blog. Count me in! Thanks Sue. I’ve added your web site and blog to the list. I’ve finally posted the entry. I know it’s late, but I hope it’s better to be late than never. There’s no deadline. Thanks for your post. Hi Rachel. I’ve added you to the list. There’s no pressure! We know how it is. Thanks Michelle. I’ve added you to the list. Might come up with other things, too. Thanks for stopping by Maiji. I’ll add these to the list. Great work! Hi, Rachel — am I doing something wrong? I’d like to be added to the participants list. Is there something I need to do to qualify? I’ve commented twice already — am I messing something up with the computer? Please let me know what I can do, because I think what you are doing is honorable, and I would like to be a part of it. Hi Shelli – Seems this was the only comment to make it through but that’s ok. You’re here now :o) I’ll add you to the list. Thanks very much. Hello there Rachel, I’ll be blogging and tweeting and anything else I can muster up! Hello again and thanks very much! I’ve added your blog and twitter address to the list. Hi Rachel, please add me to the list too – not sure what I’ll do, not had much time for blogging recently, but hopefully will come up with something! Hi Maggie and thanks. I’ve added your blog to our list. Hi Rachel, add me to the list to. Thanks. I’ve added you to our list. Best of luck with the Belfast Marathon. Your justgiving link you left doesn’t work. Hi, Rachel — I’ve just added an ME/CFS Awareness section to my website, Chronic Fatigue Community. Can you add this link to my website to my participant’s information? My autobiographical novel about ME was published last year. My blog is about many things, ME is often mentioned. I’ve added your blog to the list and hope you’re able to blog for ME Awareness this May. I’ve contacted EdMesh to see if I can get involved as a volunteer here in Edinburgh. I’ll try and think of other ways… perhaps I can try and put my visual journal online too. Please let me know if there’s anything else I can do to help! You will be busy! Thanks very much. Added you to the list. Link back to this site is already there. Am really impressed with all your hard work with the Blue Ribbon Campaign. Would you like me to add your twitter to the list of participants? Oh yes, is it possible to add Killandra and BlueRibbons4ME for twitter, as they’re sort of in transition right now. Yep no problem. Thanks again! Thanks so much btw!! It was your ribbon that inspired me. Hi Rachel – Here’s the link to my post on raising awareness. I actually have a few, but this is probably the best! Keep up the great job raising awareness! Thanks Sandy. Great post with great advice on what people can do for ME/CFS Awareness. Thanks! I’ve added it to the list and also the resources bit. What a great idea! I’d love to participate if its not too late! Great thanks Terri. Added you to the list and no it’s not too late. Thank you Cusp. You’re now on the list too. Brilliant – thanks Tea. I love the photo! Thanks again. I have been spreading awareness on my new caringbridge site and journal http://www.caringbridge.org/visit/lauradunks, on twitter http://twitter.com/redtoffee on my facebook statuses and profile http://www.facebook.com/profile.php?id=727885441&ref=profile on all the facebook causes such as Blue RIbbon Campaign cause and campaign for M.E. which I help moderate also been spreading awareness on AYME and Foggy friends and on the Blue RIbbon Campaign lj community which i created and on other communties and my lj but that is friends only. Oh by the way the link to your meaware blog is on my caringbridge site just to let you know. Thanks for the links. I’ve added your blog and twitter to the participants list and blogroll. You certainly are very busy with all your work for ME/CFS! Thanks again. I will be posting something for M.E. Awareness Day too, Rachel – thanks for all your work and dedication. I look forward to reading your post. I’ve added you to the list of 2009 participants. Thanks. I’m planning to put a post together for tomorrow. It’s been a long time since I updated my CFIDS blog…I miss being more involved online. Thanks Christine. I’ve added your blog to the list and look forward to seeing your post. Your photoessay is excellent. Thanks so much for putting in the work to put it together. Thanks! I’ve added it to the list and hope people will go check it out. Many thanks Bryony for helping to spread the word. Much appreciated. Hi everyone, I’ve put up a blog post at http://elettaria.livejournal.com/79009.html and may write a more personal post later in the week. Great to see this happening! Great and thanks so much for letting us know! Added it to the list – thanks. I’ve written about ME on my LiveJournal. It’s great to see everything listed in one place! Thanks for letting us know about your blog post Phoenix. You’ve been added to the list. Thanks for your support! Hi Maggie. Your post has been added to the list. Thanks so much for letting me know the link. I’ll try and pop over and have a read at some point! Thanks again. I have written a post on ME/CFS Awareness at my blog. Great thanks Renee! I’ve added your blog and post to the list here. Thanks again. Thanks for tweeting for ME/CFS Awareness! Sorry for taking so long to get it live. Hi Andrea. Thanks for the link to your Blue Ribbon Campaign blog post. I’ve added it to the list we have here. I think you have been very busy indeed with the BLue Ribbon Campaign. I’ve seen lots of blue ribbons on profile pictures of social media sites and links to your campaign site. Well done you. Thank you. :) I have been very busy, I pour most of my energy into it. Though it is the effort of many other people who keep it going. Makes me smile every time I see one of your ribbons on a website I’ve never heard of, or belonging to a person I haven’t met yet. For me it all started because I put a blue ribbon up in my facebook profile to help raise money and awareness on my birthday. It was your ribbon. Meeting on twitter deepened the connection to you and the ribbon. Paul – thank you so much for your post and for letting us know so we can add it to our list here. Thanks. Not too late no! There’s no deadline for raising awareness. Thanks for your post and letting me know the link. Now added to our list here. Thanks again. I’ve been enjoying your blog & looking at your art. Hope you get a chance to look at mine sometime. Hi Karmen. Thanks very much. I enjoyed reading your post. Hoping to get around everyone’s posts soon! Thanks. Hi and thank you so much for sharing your link to your blog post. I’ve added yours to the list here for 2009. Thanks. Hi! I found out belatedly that May12th is also CFS Awareness Day. I already knew it was FM’s day. I learned something new! Thanks for having such a neat site. I’m listing a link back to it on my blog. Yes, I am rather … talkative. I tend to write whole essays on my blog. But it’s therapeutic and keeps me up to date with research which is ongoing. Hi Angel and thanks for your links. I’ve added both your links to out list here. Thanks. Hi I know this is really late, but I have a blog and blogged me entire experience with ME at http://www.billygean.co.uk/ – Action for ME sponsor me and have linked to me on their facebook page which I’m getting a lot of traffic from. I am blogging my experience of ME on here (http://poeksie101.wordpress.com/) so count me in for the 2010 ME Awareness campaign!! Now I have the 2010 list up and running I’ve added you and your blog on. Have you on my links list there. Please count me in for May 2010. Thanks so much for joining us. I’ve added you to the 2010 participant list. Thanks and you’re on the 2010 participant list. Hi, I have a CFS blog and have just written a post on awareness week- http://cfs-blog.blogspot.com/2010/02/cfs-awareness-may-2010.html linking your blog. I would like to be added to the list. 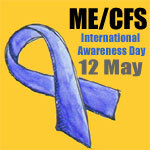 Thanks for linking to us in your blog post and letting people know about ME/CFS Awareness coming up in May 2010. I’ve added your blog to our list of participants. Thanks for signing up. I see your making good use of the badges on your blog. Thanks! I’ve added you to the list of 2010 participants. Please include me in this. I was diagnosed with ME/CFS ill 4 years before my GP realised it was actually Lyme disease. Kenneth Friedman e mailed me saying that research showed that 30% of ME/CFS patients were found to have Lyme Disease but getting physicians to re check was difficult. Thanks for signing up to blog for ME/CFS Awareness during May. I’ve added you to our list of participants for 2010. I was just thinking about this the other day…count me in! Thanks and I’ve added you to the 2010 list of participants. You can add my blog as I will be blogging as well. What a great idea. Count me in. I’ve added you to the list of participants for 2010. 91outcomes is a health blog for veterans of the 1991 Gulf War, their loved ones, and their advocates. That includes CFS/ME, one of three presumptive conditions for VA service-connection. 91outcomes will help spread the word. Please see the website for articles that may be of interest. Hi Anthony and welcome back. I’ve added your blog to the 201 particpants list. Please add me to 2010 list, too. I write a blog about my life and treatment of CFS/FM. Please feel free to add it if it is suitable. Will definitely blog in May! Hi there and thanks. I’ve added your blog to the 2010 participants list. Hi, I am blogger for ME/CFS (and related conditions). Looking forward to this years blogging for awareness month. I’ve got the badge downloaded, but not sure how to sign up. Is leaving this comment enough? If not, can you let me know? Yes just leaving a comment is signing up. I’ve added you to our list of 2010 participants. Now you just need to do your blog post in May and come back and let us know where to find the post so I can add it to our list of Awareness posts here. I’ll be on facebook, live journal and twitter again this year doing my very small bit to help spread the word. Hoping to actually get my visual journals uploaded this year too! Hello again and thanks so much for taking the time to come sign up again this year. Hi Rachel! I will be blogging about ME/CFS Awareness Day in May so you can add me to your list! Thanks Laura Anne. I’ve added you to our list for 2010. I found this place via a badge on a journal I was just reading and I also blog about my life with ME/CFS and I’ll be adding a badge to my blog! Hello there Sassy and thanks for signing up. I’ve added you to our list of 2010 participants. Leaving a note here, just in case. Not me saying I’ll do two posts for M.E. Awareness, but as usual I am never sure where I should be. As in life, so in blogosphere. Thanks again, Rachel, for all your endeavours. Will now put long overdue link to all this on blog. Thank you Signs and welcome back. I’ve added you to the list of 2010 participants. Great! Thanks so much. I’ve added your blog to the list. Thanks Grace! I’ve added your blog to our list. Please include me in your list. I have been suffering with CFS/ME for many many years although only been diagnosed 3 years. I have now also been diagnosed with FMS. I started a blog last year which was going well but then I accidently deleted everything & have only just started again. I am also trying to organise some online things & a raffle etc to raise some money to coincide with awareness week. I shall keep you posted on the progress of that. Hi Helen. Thanks for signing up. All the best with getting your new blog up and running! How annoying to have lost your previous posts. Hi, I’ll be blogging as well. It’s been 13 years this year, my M.E. is a teenager! Thanks Vienna. I’ve added your blog to the list for 2010. I’d love to blog about ME/CFS awareness again this year. My blog is: http://living-the-cfs-life.blogspot.com/ and I have a post that would be worthwhile at http://living-the-cfs-life.blogspot.com/2010/04/i-fight.html . I plan on blogging more throughout the month. Thanks I’ve added your blog to the list of participants. Do come back and let me know of any posts you do specifically for ME/CFS Awareness during May and I’ll add them here. Thanks Michael. Great post. Thank you! This blog post is a sort of day in the life of two people in a family with CFS. If you are looking for something different, just let me know and I will do what I can. Hi again Rachel, have just popped my post up for this year. Thanks for collating the list again! Sorry if that sounded terse at all, my internet is playing up and I was trying to post while I still had a connection! I’ve submitted a couple of blog posts in the last couple of days, here in this comment box. I haven’t gotten any kind of response, nor seen any indication that my comments here have been read. Jody, I’ve had difficulty commenting on some wordpress blogs recently too – the comments just never showed up, no matter how many times I tried. It could be the same glitch? Well that comment of mine showed up right away. What happened to the other three I’ve posted in the last couple of days? It’s possible that it’s the same problem. It sounds like the same thing that happened with me. I typed a message and clicked to comment — just as I have tonight, except that yesterday and the day before, the comments just disappeared. I thought maybe they were being held to be moderated (my blog does that with comments, hold them till I decide whether to accept or spam them :) but … it’s two days since the first one comment I posted, so I was beginning to doubt that that was the deal. So now, I just need to know from someone, did those earlier comments disappear and should I re-post the links? or are the comments sitting somewhere? I have tried 3 times to repost my links in the past 10 minutes. Each time the comment disappeared. The comments of mine without links in them are posting just fine. The ones with my blog links are not. I have tried over and over, and they have disappeared a dozen times. Unless someone can tell me what I am doing wrong, I guess I’m not going to be able to participate in this after all. For some reason (unknown) WordPress was putting your comments with links in straight into the spam folder. I’ve retrieved them & re-instated them – though I deleted a few so it wasn’t so confusing to read through the comments here. Thanks ever so much for your blog posts for awareness and these are now added to the central list. My email address is on the About page if you need to contact me about something like this in the future. I am just one person looking after all of this, I have ME myself and I have other commitments aside from this blog – so an immediate response isn’t always going to be possible. Sorry you had problems with leaving comments for the links. I shall be sure to monitor the spam folder closely now I know there may be a problem. I don’t think you’re doing anything wrong, but there’s a obviously a glitch. I just remembered that on one of the wordpress blogs, the comments were being filtered as spam automatically, and were eventually able to be retrieved after I contacted the author via email. On another wordpress blog, the comments were just disappearing never to be seen again. It’s all a bit mysterious. I have blogged a couple of times so far & will be blogging more plus I am organising a raffle with prizes which I have got from Channel FIVE!! I will let you know when I have the raffle sorted – was a last minute thing! How exciting! Can’t wait to hear the details. Thanks for the link and I’ve added that post to the list. Thanks Karmen. I’ve added your blog and post to the 2010 list. I have an ME blog and other blogs. Please Add M.E. & Check M.E. Out! I’m a bit confused and juggling quite a lot at the moment. Can I ask you to give me links to the specific blog and then to specific posts for ME Awareness? Just so I am sure to add the right links. will do – but at work at the moment. Ah yes I see now. I’ve added your blog and your awareness post to the lists. Thank you Shirl and I’ve added your awareness post to the list. Good morning to you too Sassy and many thanks. My apologies for the delay in getting you my article for today. I have been working with a magazine who agreed to use an interview they wanted to do for today and help us raise awareness. Woo Hoo! Here is the link to my blog and the interview. The title of the interview/article is: A Determined Spirit: Dominique’s story of learning to live with Chronic Fatigue & Immune Dysfunction Syndrome. Thanks for all the work you do! and … Happy CFS/ME Awareness Day! BTW – I also added a ping back to your blog! Hi Dominique and thanks for your blog post. It’s now up on the list. Thank you so much for collating all these and for supplying the badges – you’re doing a great job! Thank you Juliet. I’ve added your post and blog to the list and also updated the 2009 to include last year’s blog post too. Hoping to have some time to read all of the participants posts over the next few days. Thank you so much for setting this up and administrating it all. Thanks Sue. I’ve add your post to the list. Thanks again for all your hard work, Rachel!